Michael Drouillard is an associate with the Business Law and Real Estate Law Groups of Harper Grey. Michael is a solicitor with a practice interest in commercial real estate and the purchase and sale of multifamily residential properties such as apartment buildings in particular. He is also a litigator and focuses his litigation practice on real estate matters which include disputes involving the purchase, sale, or valuation of real property, residential and commercial tenancy litigation, and the representation of real estate professionals at disciplinary proceedings. Michael has a significant and diverse background in real estate. He practiced as an associate real estate broker and owned a property management business for seven years prior to entering the practice of law. 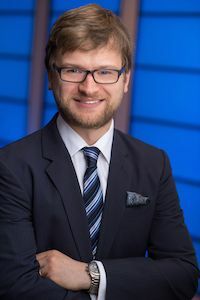 His academic background, obtained from the UBC Sauder School of Business, is heavily focused on the study of practical applications of commercial property management and commercial real estate appraisal principles. Michael’s best-selling guide “Landlording in Canada”, based on his real estate experience, is currently available in bookstores nationwide. In Michael’s real estate practice, his clients and the legal issues they face range from the owner of a single rental suite dealing with a residential tenancy dispute to a major international landlord purchasing a multimillion dollar apartment building portfolio. Michael is also one of the few lawyers in British Columbia who routinely advises manufactured home park owners about matters involving the Manufactured Home Park Tenancy Act.